Blaze offers an affordable, commercial style charcoal grill designed with your outdoor BBQ desires in mind. This American-made charcoal grill features precision cut, 304 stainless steel components which bring the promise of lasting durability to your outdoor BBQ! The stainless steel rod cooking grates maximize searing capability on the generous 550 square inches of cooking space. The cooking grates feature an easy hook and hang system for adding more charcoal or wood while cooking. Use one of the included two grill hooks to simply lift the grate and hook it to the top of the grill when adding more charcoal. Beneath the cooking grates, the adjustable charcoal tray offers powerful grilling versatility, allowing you to easily raise the tray when searing at high temperatures or move it down for low temperature cooking. The rear vents are adjustable for more control over the airflow. The charcoal tray is also removable and the full-width pull out ash pan makes cleaning a breeze. The stainless steel grill cart features two front doors for storing your grill cover and BBQ accessories. The cart also includes four heavy duty caster wheels, allowing you to relocate the grill easily whenever necessary, and two side shelves for a convenient work area. The 304 stainless steel grill hood is double-lined to protect the outer layer from heat discoloration, keeping your Blaze grill looking shiny and new! Cooking Grid Dimensions 30 1/4 X 18 1/4"
Blaze charcoal grills have a lifetime warranty that warrants against any defects in the manufacturing and workmanship of the stainless steel housing and the cooking grids. All other components are covered for one (1) year after the date of purchase. Grills must be registered within thirty days for the warranty to apply. top of the line grill at an affordable price! This grill is built tough, comes with some great features and cooks amazing. This grill is better than almost every more expensive grill I looked at at half the price in some cases. 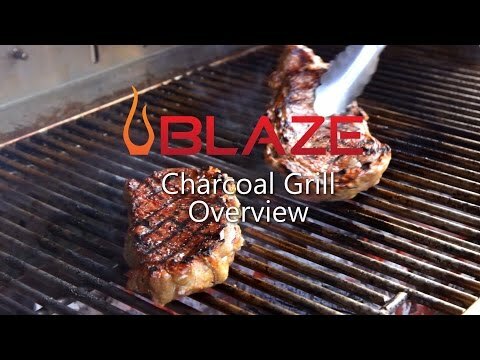 I definitely recommend this grill if you want a quality charcoal grill that will last! I have been cooking weekly on the Blaze 32 inch 4-burner grill with an infrared burner upgrade and rear burner using natural gas for more than two years. It is an excellent grill for cooking a variety of meats from hamburgers to whole chicken using the rotisserie kit. The overall design and build is excellent. The flame stabilizing grid is excellent and the grill is easy to clean! The cart is well constructed with a large storage area. I wish the grill could generate more BTUs especially when searing steaks using the infrared burner. Bottom line: I recommend this grill to anyone cooking for 2-6 people. It's a great value for the price! is it 100% stainless steel? or does have parts that could rust? Blaze grills are constructed entirely of stainless steel. Stainless steel is resistant to rust, but is not rust-proof. These grills are very durable and designed for life outdoors. 30 1/4 X 18 1/4" 33 X 16" 28 X 19" 33 X 18"